1) Postmarked Jun 14, 1926. 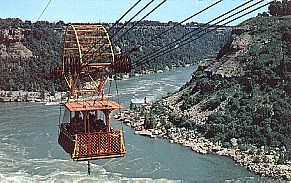 Caption reads: Aero Cable Car, Crossing the Great Whirlpool, Niagara Falls, Canada. 2) Postmarked Apr 9, 1953. Caption reads: Spanish Aerocar over Whirlpool, Niagara Falls, Canada. 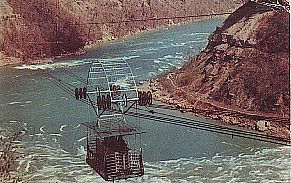 This steel car, suspended only by steel cables, transports visitors to and fro over the Whirlpool. 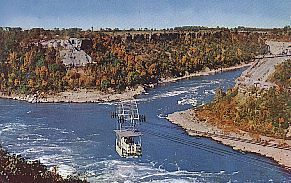 3) Caption reads: A view of the famous Niagara Spanish Aero Car as it carries sightseers across the Niagara River Gorge and Giant Whirlpool at Niagara Falls. 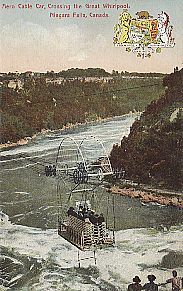 4) Caption reads: Spanish Aero Car over great Whirlpool. 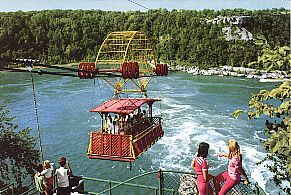 5) Caption reads: The Spanish Aerocar, at Niagara Falls, Ontario, Canada, carries thousands of visitors each year over the Niagara River for a breathtaking view of the Whirlpool Rapids. 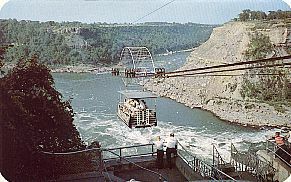 6) Caption reads: Crossing the Whirlpool at Niagara Falls, Ontario, may be made in the Spanish Aero Car, which runs on a cable high above the waters of the Whirlpool. To the west, there is an ancient gorge, which is filled with gravel, silt and quicksand to a depth of over 240 feet. After unsuccessful drilling to this depth, bits of wood came to the surface which proved to be a subarctic type of spruce, and a radioactive carbon test dates this as 14,000 years old.